With nearly 30 years experience in the bathroom industry, designing and manufacturing luxury shower enclosures and showering products, the Aqata brand is synonymous with quality, innovation and superb design. All Aqata shower enclosures and screens are hand built by our experienced craftsmen in the UK. 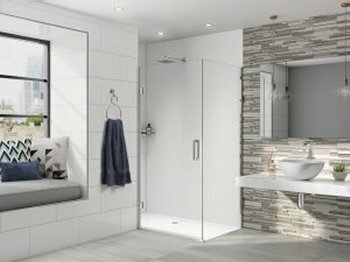 Aqata are a family owned British company with an extensive portfolio of products which enables us to offer bathroom solutions to suit all types, shapes and sizes from contemporary to traditional with an array of unique features which set Aqata apart. 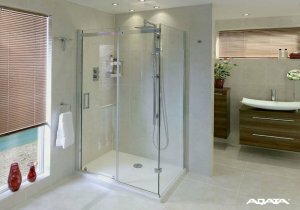 Aqata has three superb ranges of shower enclosures Spectra, Minimalist and Exclusive Solutions and a comprehensive bespoke service across all three ranges they offer a wide range of shower trays, an in-house etching service and award winning ClearShield ECO-GLASS comes as standard. All Aqata products are backed by a lifetime guarantee you can trust and everything they design has you in mind. The versatile Exclusive Solutions collection is suitable for power showers, body jets and steam. Combining traditional styling with modern precision engineering. Watertight seals and concealed fixings with built in wall adjustment provide a luxury seamless finish with a build quality to stand the test of time. From the Design Solutions range we have on display the Aqata DS458 hinged door and inline panel, corner option. On Display we have the Spectra SP305 sliding door corner option with 8mm toughened clear glass with an enclosure height of 2000mm. this combines the best of contemporary styling with superb performance and outstanding quality. The sliding door glides smoothly and effortlessly closing onto a discreet magnetic closing door seal. ClearShield ECO-Glass is supplied as standard is suitable for power showers and body jets and is suitable for placing on a tray or wetroom.